Well there is no other way to say it, we are baking hot and have just brought the air conditioning unit upstairs so that the bedrooms and my studio will stay cool during the day. Yes, we have fans, but moving the hot air around just does not have the desired effect. But we don’t mind, its great to be enjoying a proper summer, going out for early morning coffee, staying inside during the day and a long leisurely aperitivo outside after seven o’clock. Yes, it’s a matter of lifestyle and ensuring that one takes things rather more slowly at this time of year. 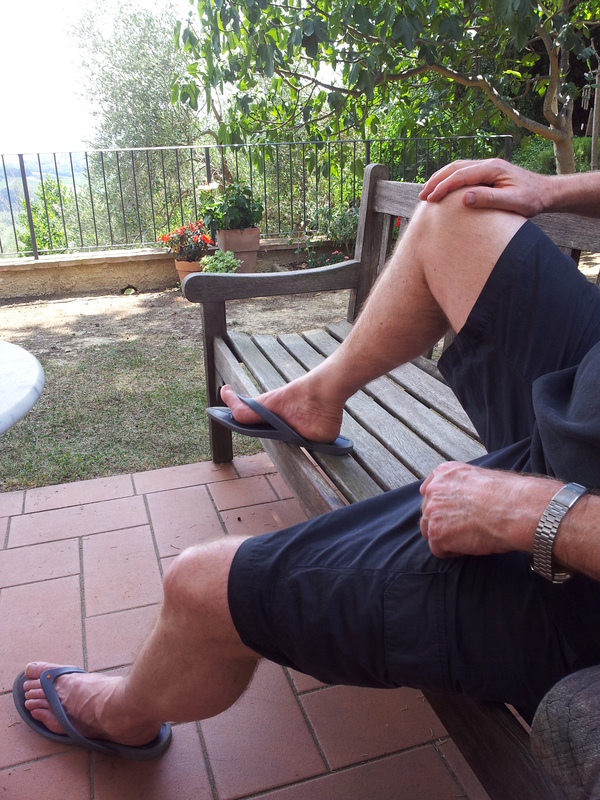 Mind you, as I write this paragraph my man is hiking from Fiano through Sticciano to our villa. Granted it is only nine-thirty our time in the morning, but it is already very hot, however, his being an ex-Royal Marine Commando carrying a water bottle and wearing a cap is all one needs. I have to admire him, he is doing this in the early mornings to keep fit! Now, on the subject of my man, I was very impressed earlier in the week when he asked me to read something on his computer screen. I am usually editing his Board Meeting reports, but this time I found a short article on the subject of his Doc Marten boots. I must say, he is a boot man. Start him off on the subject of military boots and he’ll keep you engrossed for hours, so it’s generally best to be sitting on a bar stool at times like these, with a regular top up for your wine or beer. Anyway, I read his article and was highly amused, so much so that I have pasted a copy below! The day I stopped wearing my Doc Martens! A June summer’s day in Certaldo, Tuscany, enjoying an espresso mid-morning in the Piazza Boccacio. A Harley Davidson motorcycle roars (more like glides) into the Piazza. A member of an Italian Hells Angels club dismounts with his female partner and heads for the café bar. I note they are both wearing Doc Martens boots (8 lace and red). 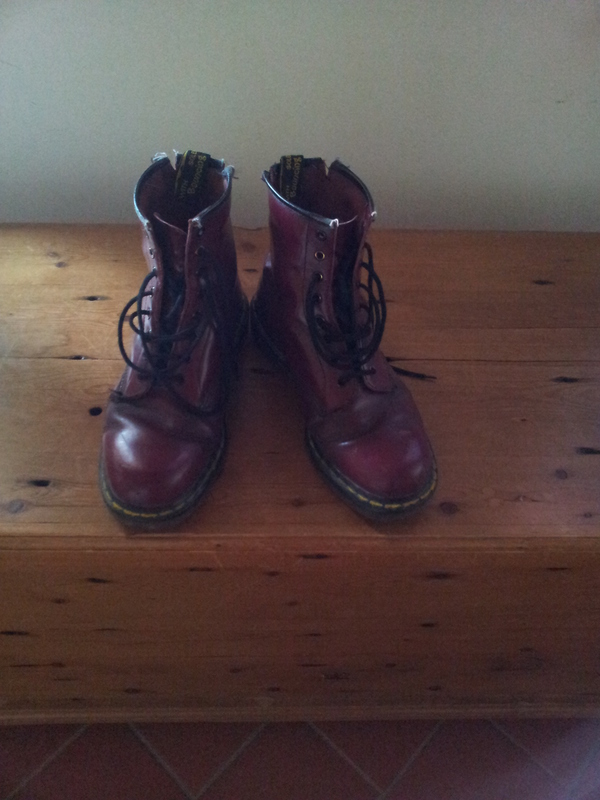 Now I have worn Doc Martens for over 30 years, they have since become trendy, and have my third pair (cherry red 8 laces). However, the biker pair from somewhere in Northern Italy, were so mild, meek and middle class, I could no longer wear my Doc Martens in the same company. From now on its beach flip-flops! 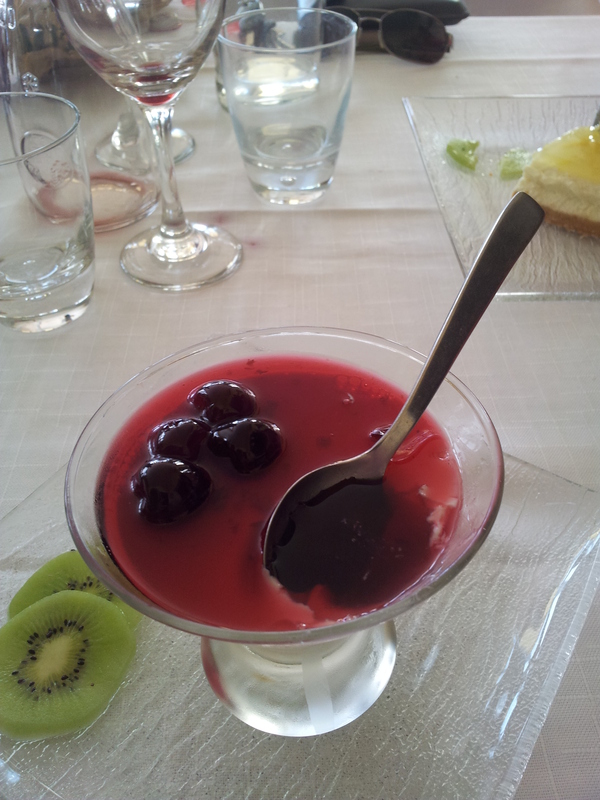 Panacotta Amarena at C’era una Volta. OK, back to this blog. As you know, we like to go to Certaldo two or three times a week for our morning coffees and pastries. However, the whole of Certaldo closed down last Friday because it was La Festa di Tomasso. Now St Thomas is the patron saint of Certaldo, so it is always a holiday; everything stops. As none of the tourist agencies check on these things, you will still see bus loads of tourists being dropped off only to find a ghost town! The poor things wander aimlessly around and end up going stir crazy in the heat! On the same subject, we were enjoying Sunday lunch at C’era Una Volta in Lucardo, sitting inside with the Italians were it is cool, when some crazy northern Europeans insisted they wanted to eat out on the terrace. Gianluca, our long-suffering waiter explained that it was too hot outside for sitting or for serving at table, perhaps they would like an inside table with a view. The terrace would be open in the evening when it was cooler. Oh no, they went off in a huff, not realising that they would not find another restaurant for miles and that no right-minded Restuarantor would be serving outside tables! Well we were happy, and having enjoyed yet another Burrata with wood grilled vegetables, I returned to my Panacotta Amarena. OK, what with the busy time we had over the concert period, it takes a little while for me to adjust back to the quiet and the need to work. But work and write I must, because come August we won’t be able to speak to anyone on the phone or get our emails read, as the Brits will be somewhere on holiday with the kids or here in Tuscany wondering why all the Italians have disappeared again, having gone off to Il Mare (the seaside) or the mountains where it is cooler. This is also a reminder to you readers that August is a bad month for coming to Tuscany unless you are in a nice air-conditioned hotel with pool, and a restaurant that serves food and wine all day! And finally, a quick update on our handsome friend Silvio Berlusconi. Last week we read that he and his ex-wife Veronica have finally agreed a divorce settlement of 1.4 million euros. Hang on, I’ll read that again. Oh, 1.4 million euros a month! Oh the poor woman….. She had wanted considerably more, but SB had appealed and got the amount reduced. Ah, friends in high places. Well, enough of that, as I said earlier I must crack on with the day job and lots of evening writing this week. I hear it is also hot in the UK, how are you all coping? Anyway, have a really good week and do drop me a line. PS Don’t forget to check out my books on Amazon!